If $M=A,$ or $N=A,$ or $M=N,$ there is nothing to prove. Case 2: $A,M,N$ are pairwise distinct and not collinear. or, $BN+CM\gt AM+AN,$ exactly what is required. 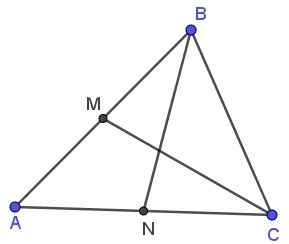 By the triangle inequality, $||2A-B||+||B||\ge 2||A||$ while $||2B-A||+||A||\ge 2||B||.$ Adding the two delivers the required inequality. Lorian Saceanu has kindly communicated to me this problem and Leo Giugiuc a solution via my facebook account. The problem and the solution are by Lorian Saceanu (Romania), Leonard Giugiuc (Romania), Kadir Altintas (Turkey).